Bush.... The final frontier, these are the voyages of the Weekend Warriors. Their five year mission, to explore new land, to seek out new tracks and hill climbs, to boldly go where no rider has gone before. Thanks to our readers and sponsors, "Weekend Warriors I" was a huge success which in turn paved the path for this, our second production: but with this realization came a big responsibility. By that, I mean the obligation we had to get out there and put together a book that was far superior to our first edition and this is something I think we have achieved with room to spare. It's been a dream come true for us, being able to ride for a living. We have had an absolute ball researching the many places in this book and have had all kinds of ups and downs along the way however, one thing still rings true, we absolutely love to ride! Like every other trial bike rider out there we just can't get enough dirt in our teeth to satisfy the passion for riding that keeps us coming back for more and more. I think it's the fear factor, I mean you can get on a dirt bike and the only thing that slows you down is you. There are no cops, no traffic lights and no speed limits. The only limits are the ones that rise up in your stomach when you're 80km plus and way too hot for the next corner. Really, how many other petrol driven sports are so accessible and give you such a rush without resulting in huge fines or fees? Not many! Not only that, there's the sense of adventure that comes from riding out into the middle of nowhere, to places you can only access on a bike, plus the freedom of just being on two wheels. Honestly, what kind of red blooded Aussie bloke would not be champing at the bit for a big weekend of camping, fishing and ball tearing, two wheeled action? Well, that's what this book is all about. If you've read the introduction from "WWI" you'll know that we're just a bunch of enthusiastic riders that wanted to spread the word about all the fantastic destinations Victorian riders had on offer. Problem with that was we had no experience, little funding and not a lot of time to do all the things we wanted to do to make the book perfect. That aside "WWI" did extremely well (thanks to all our readers) and that put us in a position to get out there and make this second book into exactly what we think it should be and what we think you, the reader, wanted. The experience and know how we gained when producing the first book combined with some welcome backing from Yamaha, along with many other dedicated sponsors (check out the sponsors page) has made a huge difference to the quality and content of this book. For "Weekend Warriors II" we have travelled even further out from Melbourne in search of the best tracks, campsites and fishing spots. Unlike "WWI" this book concentrates on venues that are more suited to weekend trips with a few that are close enough for day rides. The maps are bigger with more detail, recommended loops (where possible) and "Point to Point" rides, and instead of the "Tech Tips" section included in "WWI" we have included a comprehensive "Riders Tips" section, plus a few pages on setting up your bike and buying your gear. This is it! We have put everything into making this book into the best Victorian Trail Riding Guide money can buy and we hope you get as much out of it as we did putting it together. Click here to go to our online store and purchase. 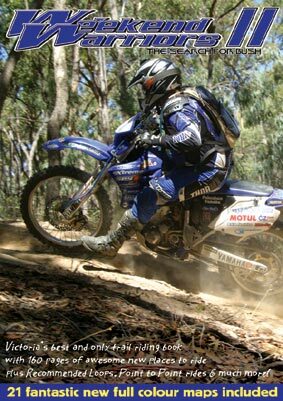 We also have a large range of Off Road parts and products that have been used and tested by us for sale. © Copyright & Construction Roost Design 2005.